Freedom is nothing that you get for free, it is nothing that somebody will give to you! In every country, among every people, every religion – the oppression of women has been established. The one who created life and social being, pulled humankind out of the darkness towards enlightenment and brought language, arts and science to the society is the woman. But nowadays it is her that is left without speach, without art and without herstory. In order so that we will reach freedom again, we have to find back to our esscence, our roots. We will return to the place where we lost our freedom. Returning – Amargî – needs struggle. The word ‚Amargî‘ is Sumerian. With this word for the first time it is known that in human existance the search for freedom, that had been lost, was expressed. The oppressed humankind was yearning for the equality of the matricentric society. It is therefore, that Amargî means ‚returning to the mother‘. With Amargî the struggle of women started – and with Amargî it continues. Our comrade Amargî Çiya, as heiress of her name, was fighting strongly for freedom. She was the daughter of the land of Afrin. With deep hope she took position in the fore front lines for the protection of her land, where today the „resistance of the century“ for defending the values of women and humankind is taking place. 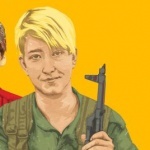 She was one of the militant and heroic women, who like Barîn Kobane and Avesta Xabûr fought for the protection of the women’s revolution and her people. So that the history of power and oppression will turn into the herstory of women, the story of the people who have been oppressed for so long, the story of humankind that is liberating itself from its chains. 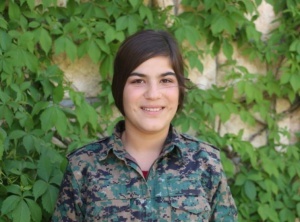 The comrade Amargî gave her life for her endless love for life in freedom. Our brave comrade became one of the flares of resistance, that engraved their names into history and whose reverberation became eternal. They mark the way of struggle. From the beginning of humankind these flares of resistance are enlightening the struggle for freedom. Untill our days their light continues. It has been passing through time and places as we can see if we look back in the past. One of these marking events occured 8 March 1857. In the city New York 129 women workers rose up against the exploitation inside textile factories. In an atrocious attack of the oppressors they were burned alive inside the facory. In order to continue the struggle of these women, in 1910 the anniversary of the massacre on struggling and hard-working women was announced through the proposal of the socialist woman Clara Zetkin as International Women’s Day. In its continuation the struggle of women in the whole world grew, organized itself and reached a new level: Women put their political, social, economical, educational and sanitary rights as well as the right to be themselves on the world‘s agenda. They became the propulsive force of revolutions all around the world. With the historical heritage from 2012 ongoing in Northern Syria the women’s revolution is being put into practice. The project of the democratic and ecologic society and women’s liberation is taking concrete form on this land. The people start to decide their agenda by themselves, put their will into practice and build up communal life on the way of freedom. The roots and strength of this revolution stem from the strength and culture of women. Through analysing the history of oppression the central role of the enslavement of women becomes even more clear. With this the whole mindset of a civilisation was put under the logic of enslavement. Therefore society can only be liberated if the woman is liberated. Against this project atrocious attacks were developed. With knowledge the fascist organisation Daesh (IS), which is the outcome of oppresive and patriarchal mentality, targeted the places, that hold in itself the culture and herstory of women. Against these attacks in Northern Syria the selfdefence of women and the people didn’t give way and through an unprecedented resistance on this ground Daesh was brought to its last breath. When its fail was already becoming clear, the fascist Turkish state instead of just supporting Daesh, by itself started to act: The 20 January 2018 a fierce war was launched on Afrin. The Turkish state with its allies of Daesh and Al-Qaida attack with the aim of occupation and ‚ethnical cleaning‘ of all people that long for freedom. They want to destroy the sister and brotherhood of the people and the spread of this spirit of freedom and resistance. 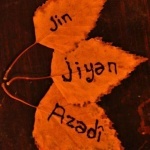 Because Afrin is one of the cradles where the human made its evolution towards a social being. It is the ground and source of democratic civilisation which is hidden in its red and fertile soil. 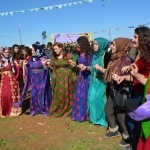 Afrin is a temple of women‘s culture and herstory. As women of the whole world that we are marching on the way of freedom, we will never give way for our will for a free life – our Amargî – to be extinguished. With our thoughts, our words and our actions we will give life to the spirit of resistance right now so that there will be a future. This war that is waged on the values of humankind and the self-administration of a free society, it is a war against all of us. Thus we all have to understand how it will globally affect life. The future of Afrin is the future of all of us. Knowing that with Afrin the esscence of women is being under attack, we as women from all people and places of the world, we have to join this resistance on a global level and support each other. On 8 March 2018 we will shake the world of power and oppression. With various and colorful actions and one multiphonical voice we will express and put into practice our longing for AMARGÎ! Therefore on 5 March women from all people of the Federation of Northern Syria, we will start our march to reach our sisters in Afrin on 8 March. We call on all women of the world to join our march! Come to protect your future! In all places of the world, raise women’s struggle in the most creative ways! Wherever you are, rise up!